Since our trip to Italy last fall, I have been trying to sample as many Italian wines as possible. I think I most enjoyed wines from the region of Tuscany. I truly love Super Tuscan’s! 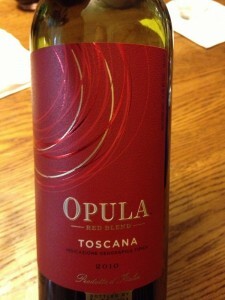 The same night we bottled out first port we tried a bottle of 2010 DaVinci Opula Toscana. Since we were making home-made pizzas I figured this wine would pair well. Cantine Leonardo da Vinci: Nestled near the Tuscan hillside town of Vinci – historic home of Leonardo da Vinci – Cantine Leonardo Da Vinci brings together 200 passionate local winegrowers, who contribute their finest grapes to an extraordinary collection of authentic Italian wines. This growers’ cooperative has more than 500 hectares (1,236 acres) under vine throughout the Chianti Region and an additional 108 hectares (267 acres) under vine in Montalcino. Rooted in centuries of winemaking tradition, Da Vinci wines embody the rolling hills and majestic vineyards of Tuscany, both in the Chianti region and in Montalcino. 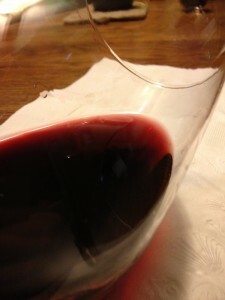 The blend was Syrah, Sangiovese, Merlot, and Cabernet Sauvignon. I tried to see if I could find the percentages but could not. The color depth was medium with a Garnet to Purple hue. The aroma was moderate and the Opula smelled fruity. We could not pinpoint on a specific fruit or spice, and the wine displayed a fruit forward aroma. The Opula was slightly dry. It was full-bodied and the acidity was nice (it did not bite us, nor tasted flabby). The tannins were medium with a long finish. The Opula was flavorful and fruit-forward. It was little earthy but soft and there was no dominant taste. The 2010 DaVinci Opula Tuscana paired very well with our home-made pizzas. I rated the Tuscan style wine two glasses.